Our descriptions of the highs and lows of life often seem to include metaphorical references to stone fruit—glorious in their peak of ripeness and as inseparable from their center pits as thorns from a rose. Interestingly, stone fruits are, in fact, members of the rose family, and those hard pits, when broken open with a hammer, exude a distinctive almond scent. “It’s not surprising that almond in frangipane, pastry, sauces, or whipped cream goes exceedingly well with stone fruit-based desserts,” notes Galisteo-based, internationally known chef, author, and cooking teacher Deborah Madison. Her book, Seasonal Fruit Desserts from Orchard, Farm, and Market (Clarkson Potter, 2010), features several stone-fruit recipes, including hazelnut-stuffed peaches and fold-over apricot pie. “For me, stone fruits are the best when well grown and picked at the right time,” says Madison, whose specialties are seasonal, vegetarian recipes with a strong emphasis on produce, and heritage fruit and vegetable varieties found in farmers’ markets. “Rock-hard peaches shipped from California or farther away just won’t have the magic that a fresh, locally grown, picked nearly ripe fruit will have. It’s sad that many people have never experienced the magic of gorgeous plum or a perfumed white nectarine. Generations have never known that stone fruits should be raised to be juicy, soft and sweet with a bit of acid to balance the flavors and make them sing.” Late summer is the time of year to find wonderful, locally grown stone fruit in the farmers’ market, says Madison, or plan for future yields by growing some yourself. One underrated stone fruit that thrives in New Mexico is the chokecherry—a wild black cherry traditionally prized by Native Americans both as a food (in soups, stews, and other dishes), and for the medicinal properties of its bark and roots. 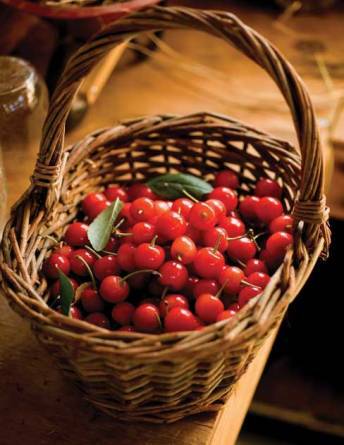 Half the size of a Bing cherry with a larger pit, a chokecherry has considerably more pucker power, but it mellows nicely when dried or cooked. Its antioxidant-rich juice makes delicious jellies, syrups, sauces—and even wine and liqueur. This recipe, from Deborah Madison’s Seasonal Fruit Desserts from Orchard, Farm, and Market, is best with fresh lemon verbena and lavender; however, dried herbs will provide good color and flavor. Madison notes that this recipe complements cakes or cookies made or topped with almonds. 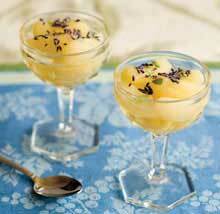 Combine the sugar, lemon verbena, and lavender in a small saucepan with one-cup water and bring to a boil. Stir to dissolve the sugar, lower the heat and simmer for 4 minutes. Turn off the heat and steep for at least 15 minutes. Strain the herb leaves from the syrup. Bring several quarts of water to a boil. Slide in the peaches, leave for 5 seconds, then remove to a bowl of cool water to stop the cooking. Slip off the skins. Slice the peaches into halves or quarters directly into a compote dish, then pour the strained syrup over the peaches. Put a few of the lemon verbena leaves and lavender flowers back in with the peaches. Lay a piece of parchment paper or waxed paper directly over the fruit and refrigerate until ready to serve. This recipe, from Deborah Madison’s Seasonal Fruit Desserts from Orchard, Farm, and Market, is the perfect dish when you have a mélange of ripe stone fruits, such as peaches, plums, cherries, apricots, and nectarines. Use whatever is available, and throw in some blackberries or other bush berries if desired. Combine all the syrup ingredients in a small saucepan and bring to a boil. 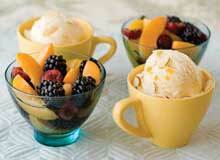 Stir to dissolve the sugar, then turn the heat to low and simmer while you prepare the fruit. Dip the peaches briefly into a pot of boiling water, then slip off the skins. Remove the pits from the peaches, cherries, plums, apricots, and nectarines. Cut larger fruit into slices. Put all the fruit (including the blackberries) in a compote dish (a glass, porcelain, or metal serving dish with a base and stem). Pour the hot syrup over it, including the spices. Cover and let stand for 30 minutes, then chill. Serve with a scoop of yogurt or ice cream. 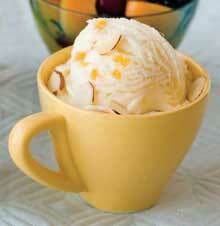 This ice cream is delicious sprinkled with toasted almonds or almond brittle, and can also be made with nectarines or peaches. Parboil the apricots in boiling water for 30 seconds to loosen their skins. Drain, peel, pit, and halve the apricots. Chop coarsely and put them in a large bowl. Sprinkle with ¼ to ½ cup of sugar; stir, and let stand for 1 hour, then purée the mixture in a food processor. Beat egg yolks in a bowl for 3 or 4 minutes until they turn light yellow. Set aside. Combine whipping cream, milk, and remaining sugar in a saucepan. Cook over medium heat, whisking often, until the sugar has dissolved and the mixture is hot. Ladle a cup of the hot mixture into the beaten yolks, whisking until well-blended and smooth. Pour the yolk mixture into the saucepan and continue to cook and whisk over medium heat about 5 minutes, until the mixture thickens enough to form a film or coat the back of a spoon. Remove from heat and add the almond extract. Cool the mixture to room temperature, then stir in the puréed apricots. Freeze in an ice-cream maker according to the manufacturer’s instructions. Create your own New Mexico cocktail with stone fruit–infused liqueur. Thoroughly wash and rinse a 40-ounce glass container with a tight-fitting lid. Wash and rinse berries. Add berries and sugar to container. Pour alcohol over mixture. Seal tightly. Let stand 30 days in a warm place, tipping the container daily until sugar dissolves. Let stand 20 more days. Strain several times. Rebottle and serve.